We can be reached by telephone at (732) 928-0278. 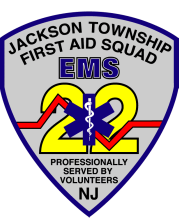 In case of emergency, you can reach the Jackson Township Police by dialing (732) 928-1111, or by calling 9-1-1. The Squad's billing is handled by Cornerstone Adminisystems of New Cumberland, PA. The main station for the First Aid Squad, called Station 1, is located at 38 E. Veteran's Hwy, Jackson, NJ. There are usually squad members on duty from 6 pm - 5 am daily.